A day of delightful foliage! 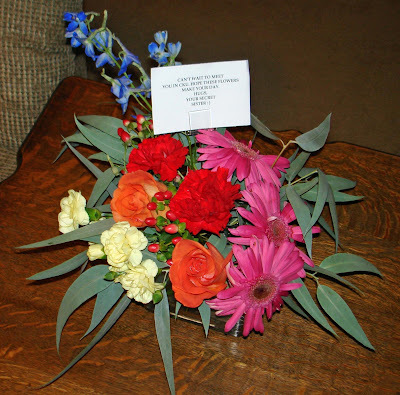 I was surprised with a beautiful arrangement of flowers yesterday. Of course, before opening the card, I asked my DH if he had sent them. "Why would I send you flowers?" Exactly. So I then figured they were from my Secret Sister since a Secret Admirer seemed a little far-fetched. And they were from my CKU Provo Secret Sister, "Sissy Rinaldi," whom I am very much looking forward to meeting next week at the event. Thanks, Sissy, they did, indeed, make my day! I also had some groceries to pick up at Wal-mart, and I found they still had a few of those unique little hanging plants with the bucket-like leaves. They were on sale, so I just HAD to have one. When I checked out, one of the ladies said she had one at her house, big and full, but it no longer had "pitchers." "Yes," she said it what I think wass a Scottish brogue. "Pitchehs, loike, poorin' pitchehs... those are called Pitcheh Plaunts." 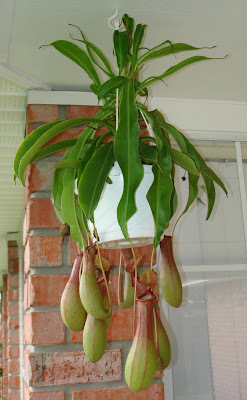 I Googled pitcher plants and, it turns out, I have a science experiment in my own backyard now. Related to the Venus Fly Trap, the plant's pitcher leaves fill with a fluid and attract insects, which fly into the pitchers and drown. The plant then eats the insects. They are very tropical, love humidity (which is why the lady's plant does not have pitchers - her house is not humid enough, I will have to tell her next time I see her at Wal-mart, she was a bit concerned) and are sometimes called "monkey cups," because monkeys have been seen drinking the fluid out of them in the wild. How fun! Tissue box/album designer now on the Message Board! A number of you have ordered the new tissue box album and now that you've gotten it, you may be wondering how to get started. 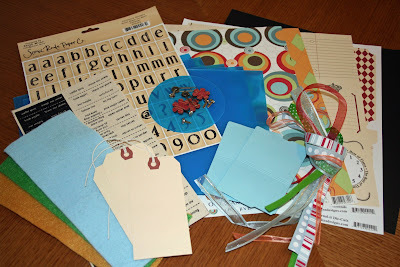 If you need som ideas, check out the idea section of Kits2Remember. Or, better yet, "chat" with the designer herself! 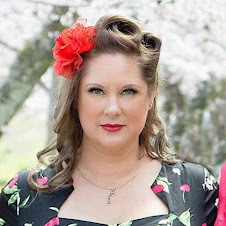 Jennifer can answer any questions you may have on the Kits2Remember message board, plus help you with ideas, techniques and more! And the entire K2R Krew is at your disposal, so if you have fallen in love with one of their projects and want details, post a message! A very productive five days! Well, I haven't posted in several days, but don't think I've been snoozing! Friday night I headed to my new LSS, which is a half hour away in Foley, AL. Gigi's Scrapbookin' and More has a huge variety of product, plus some stuff I hadn't seen before, and owner Gigi (who would have guessed that was her name? LOL ...) and her staff were very welcoming. So, I look forward to shopping and cropping there in the months to come. As a matter of fact, I already registered for their three-day crop in January at a local beach resort here. Maybe I won't have to go through scrappy withdrawals after all!!! Photos just don't always do acrylic albums justice, and the layers can be confusing in the 2-dimensional world, so I will do my best to explain what I have done. Everything seen here, with the exception of the o-wire for the Bind-it-All and anything liquid (paint, ink, Stickles, adhesive) is included in Krew Kit #6, so you don't have to wonder where I got it. I got it in the kit! 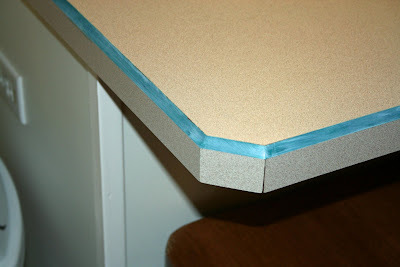 I used Adirondack paint dabber in Cloudy Blue to "distress" the edges of all the panels. I find that this helps the different clear layers stand out better. 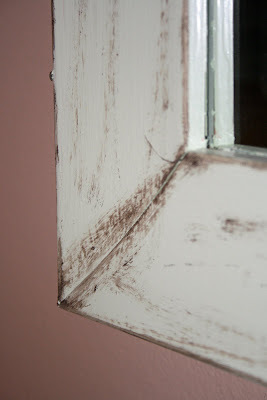 And you only have to paint one side, since it IS clear and will be seen through both sides. With paint, ink, Stickles, etc., remember that on acrylic, less is more. Less product means it takes less time to dry through the non-porous plastic and you won't have to worry about buckling paper or embellishments. 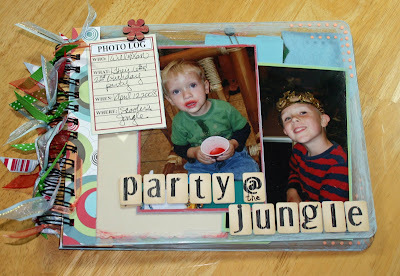 Then I took one of Teresa Collin's journaling cards to give a brief synopsis of the album's subject: My boys' 6th and 2nd birthday party at an indoor play gym called Scooter's Jungle. I LOVE these journaling cards. Well, any journaling cards, really, Cosmo Cricket, 7Gypsies and other companies also have some great ones and they make journaling fast and much easier! Even though I was a copywriter in a former life, I still hate to take time out to journal, although I know how important it is. Plus, as much as you may "hate" your handwriting, it is important to have samples of it around for the sake of future generations. These journaling cards make it easy to leave some "samples" around. I backed the title stickers with what I would call a sub-title, to cover up the blank, sticky sides of both sides. This might take some planning on your part. I started with the title, and then worked on a sub-title that was appropriate, and fit the more-important title on the cover. I also backed the cover journaling card with another one on the inside front cover and added a paperclip for fun. The scalloped manila-colored paper behind Xan is actually the back side of a Teresa Collins journal page that come die cut in a set of four in a 12 x 12 sheet. You'll see more of it on the next page. There's the front side of the journal page... and a lot of fun little details such as silly canvas tabs, mini file-folders and orange dots created with Sukura's Souffle pens. Have you tried these on non-porous stuff? They also have gel pens that are just beautiful. In this album, I used a "mirror-image" technique, by covering photos on one side of the panel with others on the other side. This is the easiest way to design with acrylic, and the technique I encourage newbies to use until they get the hang of acrylic. 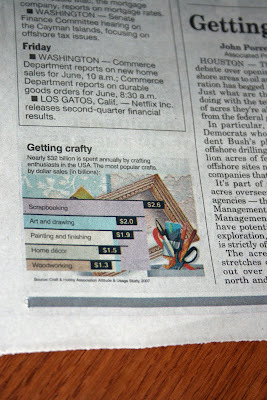 The scalloped journaling page is an example of a "layering" technique, where items on either side are layered over each other in different areas to hide the adhesive holding them on. This method takes a little more planning, but can be a lot more interesting to the viewer as they try to figure out what is where in the album. I also added a felt cut-out to the top right corner. I liked the additional texture, plus it is a functional addition - it adds additional protection so the pages don't slam together as much as the pages are turbook is handled. Here I bound in another journaling page and, well, journaled. I love the fact that Scooter's not only encourages, but GUILTS parents into participating. If other adults are playing, I don't feel like such an immature brat for sliding and bouncing as much as the kids do! I only adhered the top, bottom and right side of this photo of Will so that I could slide the tags in the "pocket" created. More journaling and/or photos can go on these! Who said mini-books don't ever hold enough photos? 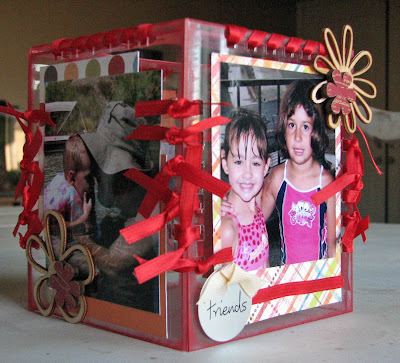 Hidden and interactive elements are a great way to display dozens of photos in one small book! Need more ideas? Check out with the K2R Design Krew has done by checking out their blog... you never know, they might be announcing a RAK soon! 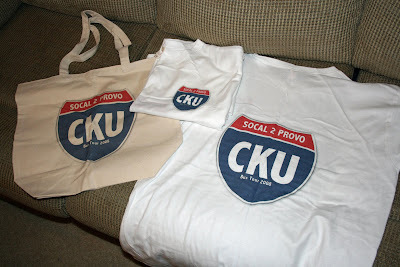 As for the rest of my time, I am working on my "homework" for CKU Provo, tying up loose ends on the SoCal 2 Provo CKU Bus Shopping Tour and getting ready for the San Diego Scrapbook Expo. I will be updating my calendar soon, so be sure to check it out! I have also found an LSS that looks promising and only about a half hour away: Gigi's Scrapbookin' and More in Foley, AL. I am, cropping there tonight to get a feel for it and I am SOOO looking forward to it. I am going through withdrawals! Put a comment on the blog from July 22 until the end of the month and one lucky poster will get a 6-inch acrylic album sent to them FREE! I'll announce the winner here on my blog Aug. 1 ... one comment per day per person, please! Good luck! and the SoCal 2 Provo Bus tour I am organizing. Now I have a lot more scrappy T-shirt options in the closet! Whenever I feel like cooking, which happens once every blue moon, I make fresh salsa. DH Rodney loves it and it makes him and the kids eat vegetables! It is a recipe, if you can call it that, that I got from a true "mamacita," a Hispanic photograher friend of mine's mother who lived in Yuma, AZ. 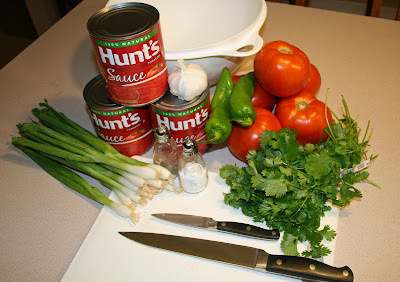 I don't eat tomatoes or green onions in any other foods and I love my salsa CHUNKY! 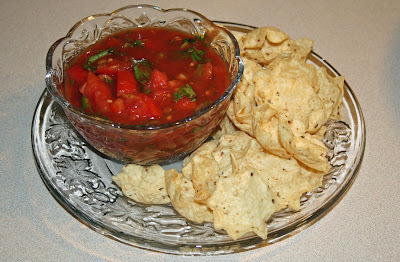 The hot, humid weather here made me just CRAVE some fresh salsa yesterday, so I "cooked" some up! - chile peppers: I use two anaheim chiles (pictured)for a mild to medium salsa, five to seven serrano chilies (they are smaller than anaheims) for a medium to warm salsa. Jalepenos can be used, too, but I just do not care fo the taste. I use my Tupperware Superbowl to mix it allin. I think it is a 2-gallon bowl or something crazy like that. Sharp knives are a must. 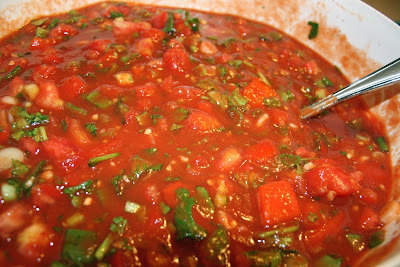 3) chop tomoatoes, green onions and cilantro the way you like, bigger for chunky salsa or finer for not-so-chunky salsa. I always chop the onions, chilies and garlic last in case the smell gets overwhelming. 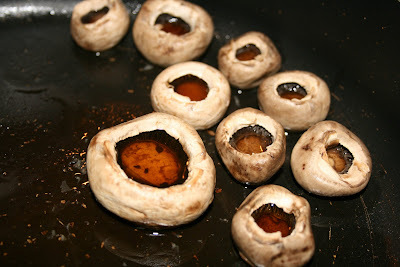 6) add some salt and pepper, mix it all up, have a bite, add salt and pepper as necessary. 7) Enjoy! I like using Tostitos Scoops so I can get a lot of salsa in one bite! And I love that these ingredients are not super expensive and the amount you make will last a week, or be great for a party. 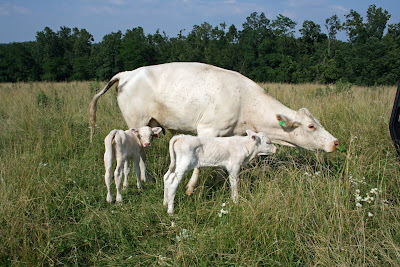 Plus, like I said before, the family will get their vegetable servings! Anyone else have a great salsa recipe? Post it here, I'd love to try it! The reason I bring this up is because I have now moved into a home and I have been running around trying to make it fit so I can sleep at night. 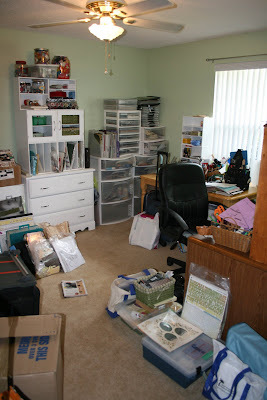 Seriously, while being Type A allows me to get a lot done in a short period of time, and hopefully get it done well, my "mess" of a new house is really wreaking havoc on my creative abilities, which I will need to call upon soon to create projects for various events coming up, not to mention my own kids' albums. if my house is not in order, than I can't concentrate on being creative. Anyone else have this problem? In my rush to get my house they way I want it so I can dig into "real" life scrap stuff, I have had to call upon my scrap stash a few times - thank God I have one! For starters, my kitchen island and counter tops had a peachy-pink, salmon-y stripe that went around every edge. Anyone who knows me knows this just would not do, as I can only handle pink in small doses, and certainly not in my kitchen where I would have to see it every day! So, enter Adirondack paint dabbers, Distress Ink and Mod Podge! After a few hours of work and some painter's tape, I have a teal-bluish stripe that matches my new home decor of sage green and slatey-teal blue. Viola! On to the next room! Somewhere I read that the average American spends 16 years of their life in the bathroom. Interesting. So, knowing this, I wanted a bathroom that was relaxing, calming. 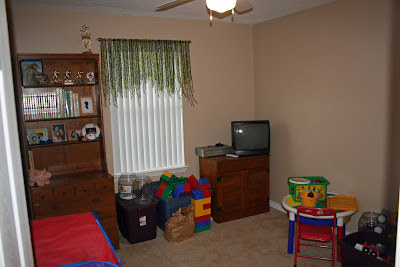 Actually, I wanted my whole house to be in soothing Earthtones of beige (which the house's walls were already painted), sage green and slatey-teal, since I am 1) Type A and don't know how to sit down and do nothing, and 2) planning to be on the road a lot and want an inviting haven that I can come home to and attempt to sit down and do nothing in. Since it sounds like I will spending quite a bit of time in my bathroom, I wanted to really like it. We fund a great distressed sage-green hamper and I wanted a mirror to match. 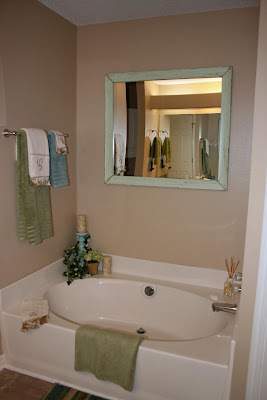 I figured finding one to buy outright would be next to impossible, so I found a pine mirror on clearance at the Navy Exchange here for $15 and used some of the Pastel Sage paint I used to paint my scrap room and Florida room, since I had a gallon or so left over. Then I took my Adirondack paint dabber in Espresso and distressed it. DH Rodney hung it up and, while it is not a high-quality mirror, it was less than $20 and I love it! Next! 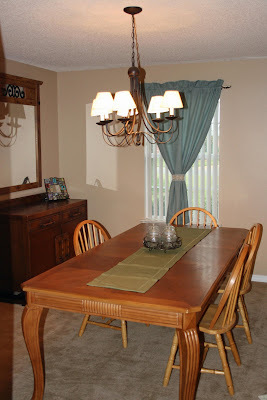 I love having a formal dining room. 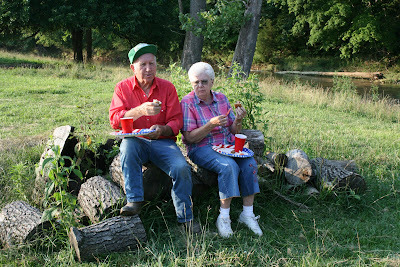 Our families plan to visit often and I want a place where we can have family dinners and accommodate everyone. The mirror was another Navy Exchange clearance item, solid wood, for $20. Gotta love it! The curtain was a "piece of fabric" I found at an antique store for $7 that turned out to be a curtian in just my shade of slatey-teal. 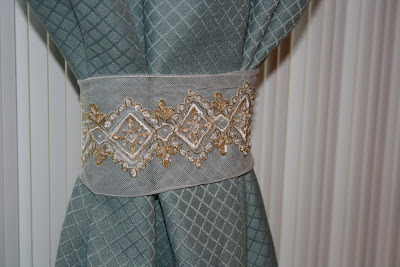 I grabbed a piece of trim from my ribbon scrap stash and tied the curtain to make it a "window dressing." Oh, and JoAnn's has a bunch of their deco curtain rods on sale right now - that one with the leaves was $3.95 - how can you beat that??? Onward! My boys now have a play room and I am using a My Minds' Eye metal sign I got at the Scrapbook USA Expo in April as inspiration. 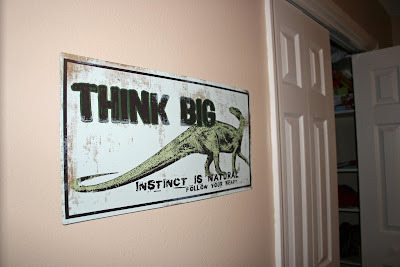 The playroom will have a realistic dinosaur theme and the wall on the right will soon have a huge dinosaur mural painted by my sister-in-law, who is a very talented artist, but doesn't use her abilities as much as I think she should! i want a tree painted in the corner, streching across the window wall and I'll tack up vines across the ceiling. 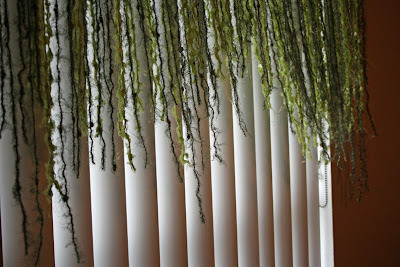 For the curtain, I wanted it to look like stringy moss coming from the eventual tree, so I used two different green fiber skiens, cut them up and knotted them on to the curtain rod. The effect is exactly what I was looking for! While I haven't ben using a whole lot of scrappy stuff in the other rooms, I have been working on the guest bedroom and living room quite a bit. 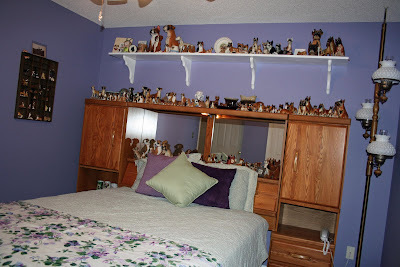 The guest bedroom used to belong to a pre-teen Hannah Montana fan and is a lovely shade of purple. Purple I can handle better than pink, but I would never paint an entire room that color. 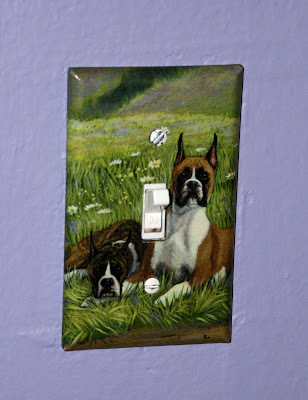 But the paint job was fresh, in good shape and I really didn't want to repaint it, so I embraced the purpality and added greens - and the browns of my boxer dog collection. The quilt is one my mom made for me, only flipped upside down so the green side shows. 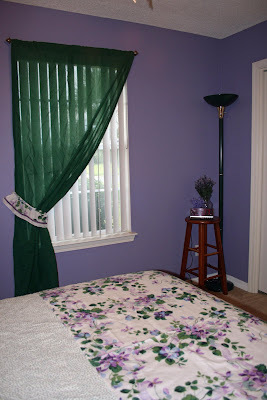 The violet coverlet is actually a curtain I got for about $8 at an antique store. Silk flowers on sale at Michaels (all of the craft stores have their "spring collections" on sale for 50 percent off or more), throw pillows from Wal-mart and a green curtain panel I've had for years finished it off. As for the Boxers, that is a collection I have had since I got Slade in 1997, and it just keeps getting bigger with gifts, eBay and the like. I have both contemporary and antique pieces. This one here is dated 1958, so it is 50 years old this year. 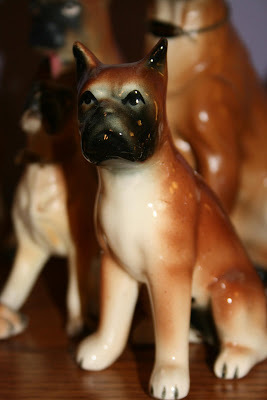 A lot of the antique Boxer pieces were made in Japan in the 1950's. The dogs had just been imported from Germany and the Japanese really liked them. Boxers came over to America just after World War II, also, after the American soldiers had seen the dogs and fell in love with them. 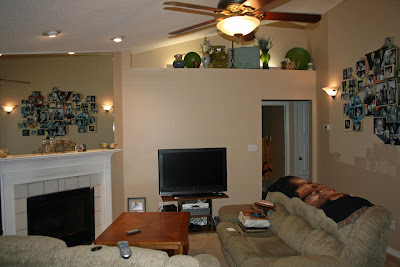 The living room has lit plant ledges on either side of it, just begging for treasures to be displayed. So far I have littered them with some stuff I have had for years, ceramic peices I have made and found, antique store finds and the like. Some of them have their own story. It will be a continious work in progress, focuassing around my "signature" colors and the themes of home, travel and Florida as a vacation destination. I only have boxes with framed photos left to unpack, so my Type A brain is starting to calm down a bit. 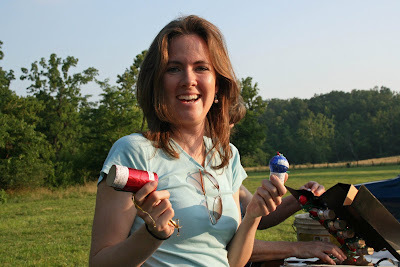 Then I can focus on finishing up my scrap studio and get down to some creations! This week's NEWs at K2R! I like NEW, how ‘bout YOU? I have spent the day doing inventory on my stock here in the Sunshine State, plus I have uploaded some NEW stuff I’m sure you’ll love! • Join the Krew with a Kits2Remember T-shirt! Kits2Remember logo apparel, tote bags and more are now available at Café Press. 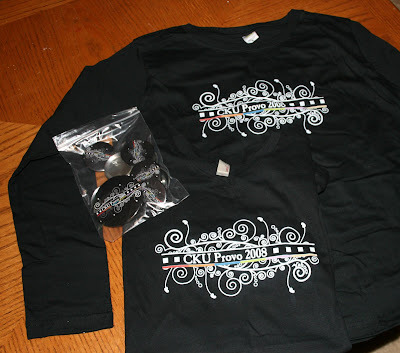 Wear your Krew gear, buttons, etc., and you might be an RAK winner at our next event! • Storewide Sale: Select items across the K2R “shelves” are discounted 40 percent … ATG guns, project kits, Basic Grey collections, Rouge de Garance and more! Browse around and see what affordable treasures you can find! • We have new ideas in our Project Idea section, too! Be sure to check it out, along with the K2R Krew Blog, Jessica’s Blog and the interactive Message Board, where you can ask questions and share scrappy advice! • K2R fan and friend Jennifer C. from SoCal came up with a great new acrylic project, so she has partnered with K2R to bring you the Tissue Box/Album. This affordable acrylic project (only $5 each!) is cut perfectly so it adorns a square tissue box. Not into home décor projects? No problem! You can also put the panels together to create a 5-panel of stadium cover album. 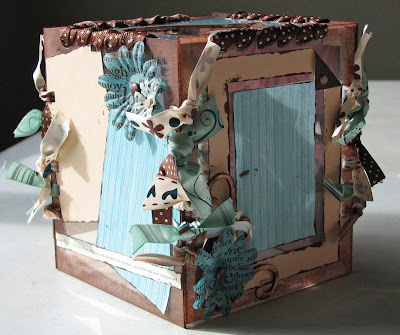 There are several different die cut box tops to choose from, so log on here to find out more! 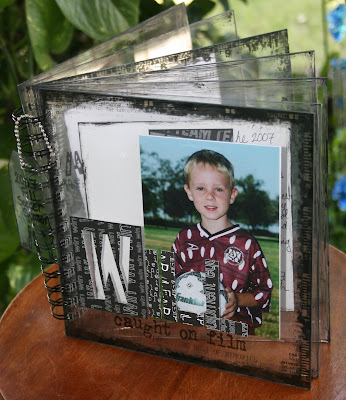 • “Caught on Film” is a kit I designed to accommodate both pictures of my Kindergartener’s first soccer season, and my DH’s last softball season. 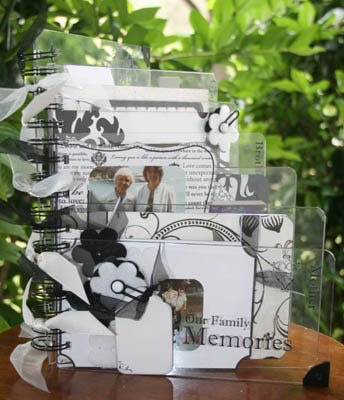 It’s a great 8 x 8 acrylic album that even a teenager will appreciate. • Krew Kit #6 is here! These kits have become a mainstay at K2R and we’re rolling out our sixth one! If you loved the feel of Krew Kit #1, you will love KK6, as it also features warm, 1970’s-inspired double-sided paper, journaling blocks and die cut pages from Teresa Collins and a five-panel 8 x 10 acrylic album! Plus, the Krew will start posting their project ideas on their blog starting July 28! You’ll get up to four ideas for every Krew Kit! Some of our previous Krew Kits are still available, so if you missed out on those, be sure to order because once they are gone, they’re gone! Ideas for ALL of the Krew Kits are on the K2R Krew Blog. • More Adirondack paint dabber, StazOn ink and Stickles colors added! • Basic Grey magnetic closures and craft magnets for use with the K2R metal sheets are now available! • UNdrilled Clear Scraps acrylic albums updated! As always, thank you all for your support! Kits2Remember would not be what it is today without you! The Craft amd Hobby Association Summer Convention & Trade Show will be moving from the Chicago area to Orlando in 2009! For those of you who work in the industry, the trade show will be July 28-30, 2009. Well, of course I found a box full of kits after I sent out a big group of orders! I now have about 20 "Americana" kits, which were in a box labeled "Garage-Files." Anybody else file bills and stuff in red and blue cardstock with ribbon? I had no idea I did, but according to the movers, I am quite embellish-ful with my filing. 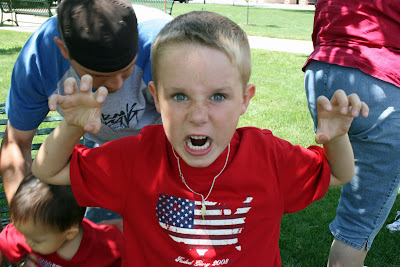 Grr! 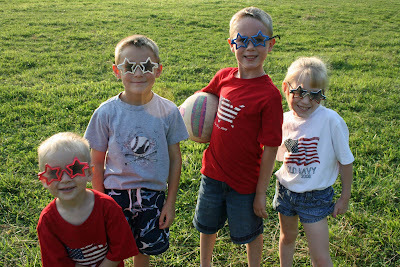 Anyhow, good news is that I have the Americana kits in stock, just in time for them to be 40 percent off this week! Check out the site for details: www.kits2remember.com. ... include "losing" some boxes of my K2R kits, apprently. I am not sure what happened at this point, but three of my kits have gone missing: "Americana" amd two that were boxed together, "All Together" and "Friend." Hmm... a big bummer for me, especially since a number of you ordered these kits. I apologize for not being able to include them in your orders and I removed them from the store. I am honoring all the deals you would have qualified for with your original purchase though. I hope this makes up for the inconvenience a little bit. Also, I have added a few kit specials on to the web site, as well, so poke around, if you've got the time during these "lazy" days of summer. Everyone who is in the Windy City, I hope you have fun, and be sure to post the new stuff those of us stuck at home can't see! 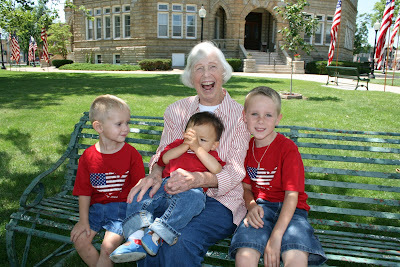 Family Memories project photos up! 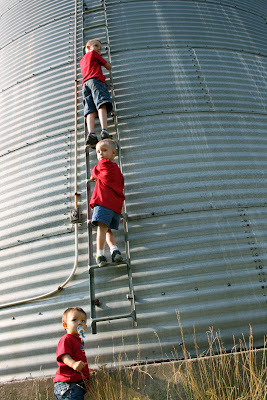 Thank you to those of you who purchased the Family Memories vertical stadium album kit and were patiently waiting for the photos to be posted. While this kit does not come with step-by-step instructions like many of them do, please feel free to view the photos here and email me at jessica@kits2remember.com with any questions you may have. ... or should I say California? While Florida may be The Sunshine State, you can't prove it by the monsoon-like weather (can you tell I lived in Arizona for awhile?) we've been having since I got here last week. I have been here officially for a week now, and while the weather is leaving my never-ever-frizzy straight, fine hair, oh-so-frizzy, I have to admit that I love my house, the fact that I can get fresh-brewed iced tea ANYWHERE and that everything outside is so dang GREEN! After living in the "green desert" of California and the "desert" desert of Arizona for so long, it is so much fun to see green grass, trees, plants, etc. I am enjoying the wildlife. I lived in Texas for about five years of my childhood and it's great to see armadillos again. Although, all but one I have seen have been roadkill. I am also enjoying the tropical plants available to me, including these houseplants at Wal-mart here that have modified blooms or leaves - can't tell which that form little buckets. Way cool. I already told the DH that I just HAVE to have one! It has been incredibly busy for me since my last post. 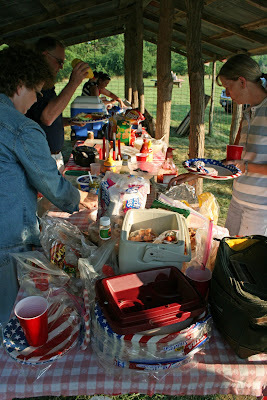 We celebrated 4th of July country-style: On grandpa's creek property with hot dogs roasted over an open fire, where my sister-in-law, Jill and the family nurse, Aunt Sam, lit off the fireworks for a crowd of about 60 family members and friends. 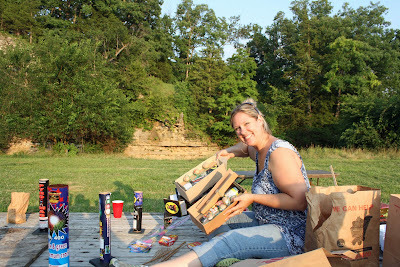 I helped get the $500 worth of fireworks ready for the big display - we always seem to end up with way more fireworks than expected, since everyone pitches in money or their own purchases for the good of the show. 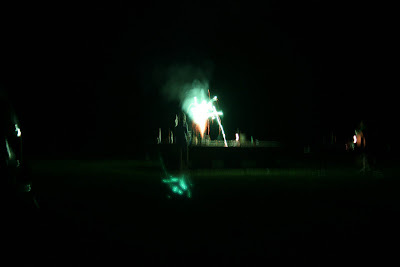 A softball game was started and played until you couldn't see the ball any more in the darkness. 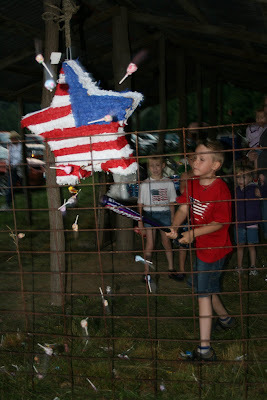 Cousin Amy brought a patriotic pinata for the kids, so they could celebrate Cuatro de Julio in style! 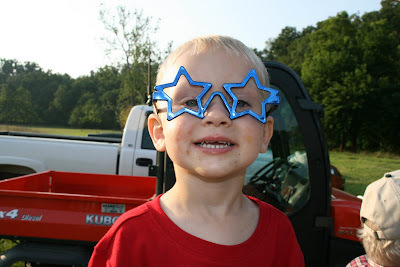 I brought in some star-shaped sunglasses for the kids for a "Starry-Eyed Surprise" (remember THAT song, LOL)... they were a hit for about 15 minutes... gotta love the Target dollar aisle! both looking very strong and healthy. More often than not, one or both twins are lost. 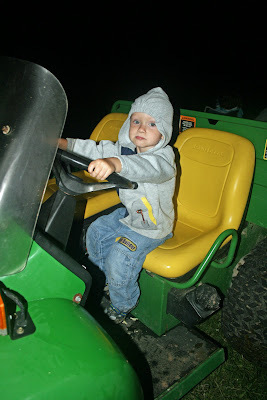 Mama looked tired, but wasn't too tired to reach out to try and sniff the Kubota "pumpkin truck" we were riding in! 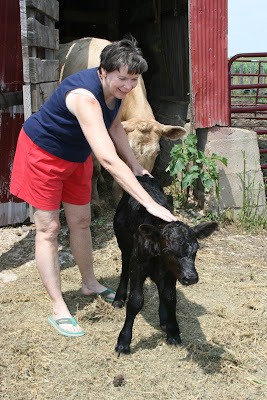 I am so glad I made Aunt Brenda stop at my car for the camera before we headed out to the pasture! 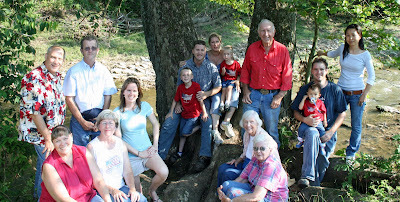 We also took to opportunity to get photos of the entire family together: How often do both Rodney and I have all of our immediate family in one location? 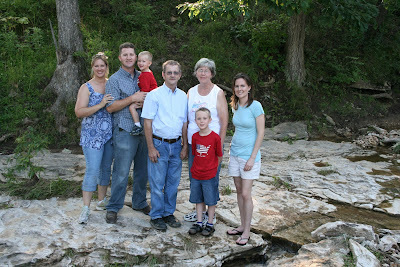 Grandparents, parents, siblings, the works? 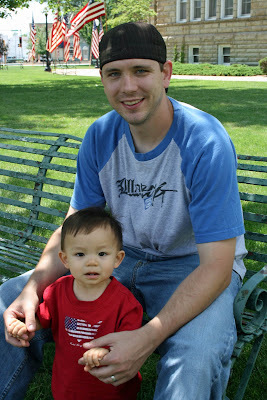 Once for our wedding in 2000, one for our reception in Illinois in January 2001 and now. So, of course, everyon grumbled about having to take their photos, but now everyone wants copies ... that's a scrapbooker' life in a nutshell! 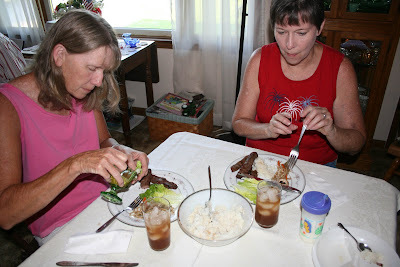 As a thank you to Rodney's family, my SIL Gina cooked up some very tasty Korean BBQ, a dish that was new to most of the family. 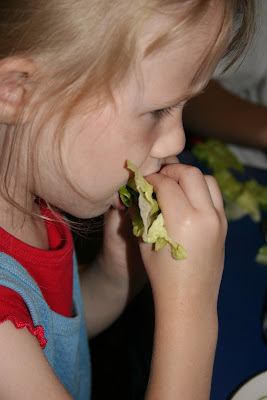 "Lettuce tacos," tiny "bowl" mushrooms and tender, tasty beef and prk were on the menu, along with sticky rice, which explained how asian people can eat rice with chopsticks - it sticks together in easy-to-grab clumps! Grandpa wasn't the only one with new baby cows, Aunt Sam also has a little black beauty bull, with looooong eyelashes that this picture just doesn't do justice for! 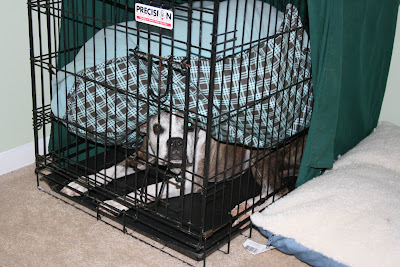 (Marble is cowering in her crate, desperately trying to hide under her bed mat), but they love the big backyard they can run around in - evn Slade, who is now off of "emergency" medication and now on to stabilizing medication he will remain on. But he is quite perky, gaining some weight back and managing to jump on the sliding glass door between the Florida room and the house when thunder cracks. Thank you to everyone who has inquired about his health ... I really appreciate it! Rodney is running around from one home improvement project to another and I am trying to empty cardboard boxes as quickly as possible so I am no longer living in a sea of them! While my package from my Creative Escape Secret Sister arrived Wednesday, I did not have time until Saturday to open it! What a thoughtful treat! 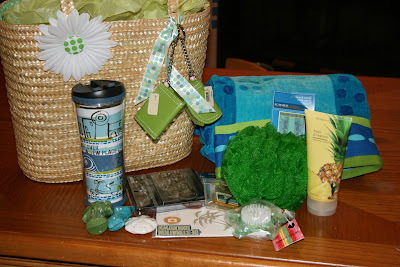 There were all sorts of Florida-inspired goodies in there, my absolute favorite being the pineapple shimmery body lotion. I didn't know how much I liked the smell of pineapples until I got a whiff of that! Thanks SS! Kits2Remember is back online and ready to take your orders. I am having a 50 percent off all kits in stck sale right now, combines with the following offers: For every 5 kits you order, you get a sixth of our choice FREE! Plus, any orders of $95 or more before taxes and shipping, get FREE shipping. So, take a look around the kit store and see if there isn't anything you can't live without! Also, if you are looking for a last-minute vacation opportunity, registration for the SoCal2Provo Bus Shopping Tour is open until July 17th (Thursday) so find out more by logging on to www.ckubustour.com. And thank you to you all for your patience, understanding and support during this huge transition for me and my family - I truly appreciate it!